Looking for a glamorous ball or party dress? Get dressed to impress with glam dresses and a touch of sparkle at The Warehouse. 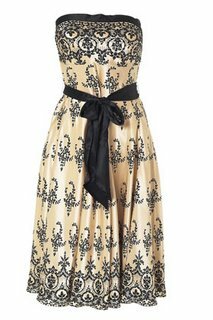 My pick: I love the gold chandelier print dress (Product code: 055022783) shown here which I think at £60 is a hot buy. If you're after something more formal then when you visit The Warehouse also check out the peacock halterneck prom dress (Product code: 055022629), which, reduced from £60 to £40 is also a best buy. It's all a matter of the occasion and your own personal style but whether you're going to be the belle at the party or ball, The Warehouse has a big range of new styles and hot buys at the moment and there's a good chance that there is something there to suit. anyone know how to get hold of it? I'm a guy, but I have to say that the dress you've posted up above with the pic (the gold chandelier print dress?) is actually quite stunning. It is certainly different to what other people wear, especially young ladies, and I think it's stunning. I'd really enjoy seeing my wife-to-be in that dress! Pity we don't go to enough 'glam' balls or parties around here... not that everyone has the money to throw them. Of course, we could do something a little more on budget if we wanted to and I think I should chat to my girlfriend about that. Not too sure on a peacock dress though! You should have posted a pic so that some of us could be convinced about that one. It may be a little too far out! Even for someone like me who enjoys the different and the daring.